Looks classic enough, doesn't it? There’s a surprising amount of really excellent comfort food to be had on the Upper East Side. I say “surprising” because with such a vibrant neighborhood you’d imagine restaurants would come and go with some regularity. But the classics, as always, endure. And though it is not actually a classic (by New York standards, since it opened in 1972), JG Melon has been around long enough now (almost 40 years!) to earn the respect associated with one, and well deserves being treated as one. So what is the place, and how has it endured? 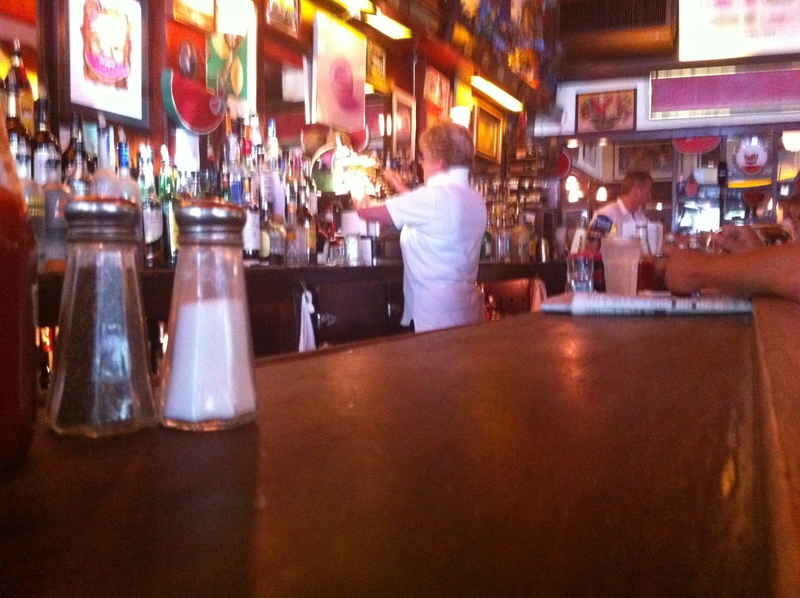 The bar preserves the old-school feel. 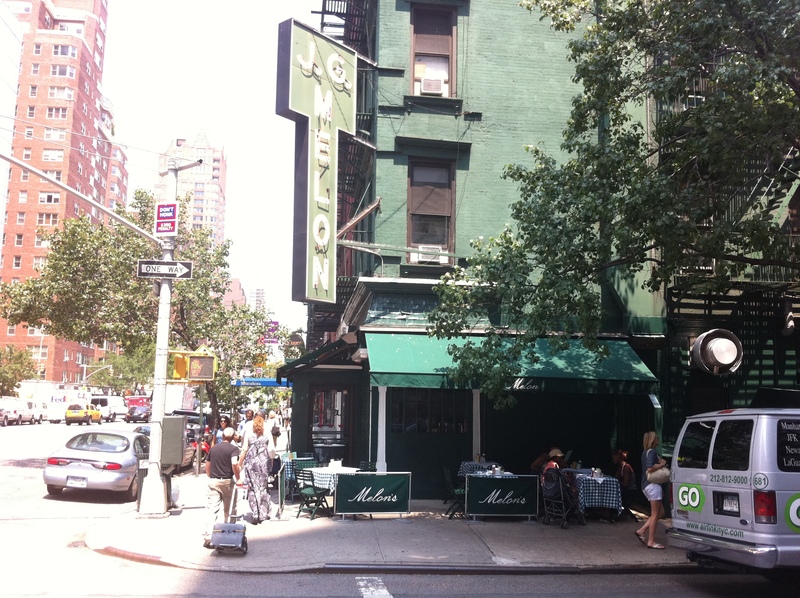 Simply put, JG Melon is a classic New York bar of the old school. Take note of all the images of melons behind the bar, that’s the only nod to shtick they make. On a blazingly hot, soupy summer day, the air conditioning inside was excellent and welcoming, as was the wonderful, no-nonsense bartender. The place is pretty dark within, which is nice, and teems with regulars, and foodies on a quest for their burgers. Like the original PJ Clarke's, there is an outcropping - this time, though, it's for the kitchen. 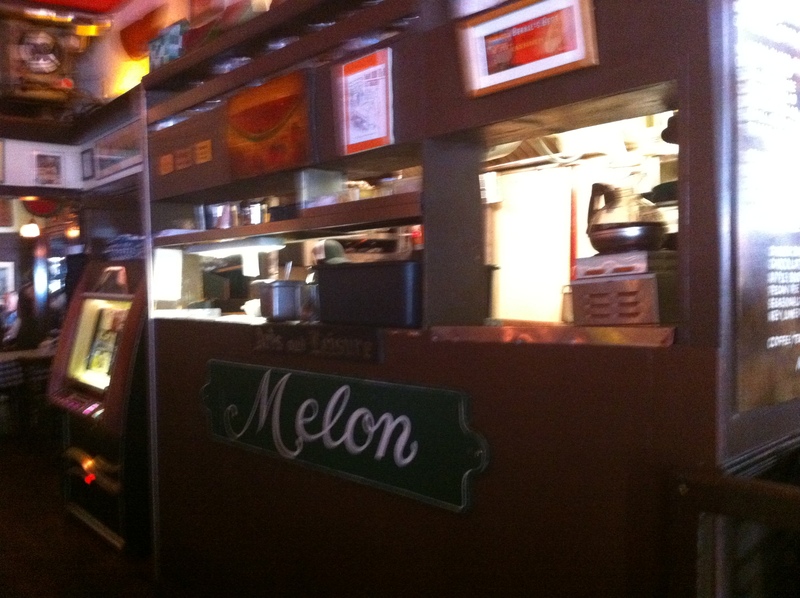 Apologies for the blurriness of the picture above, but JG Melon is not the kind of place you’d feel comfortable using your cell phone within. I think it is frowned upon, since it really is an old-school bar. And as previously discussed, cameras and restaurants can quickly become controversial, so these snaps were taken hastily. Nonetheless, what you’re looking at there is the outcropping that hides what I gather to be the grill for their burgers if not their entire kitchen. It sits just a few feet away from the bar and folks within are working tirelessly to produce the deliciousness you are about to see below. A serious patty for serious hunger. Again, the dread blurriness, but I felt as though I was pushing my luck just by holding my cell phone. I got the sense they are frowned upon there, which I well understand. JG Melon, in my opinion, is meant to be a respite from that sort of behavior. I trust you can see, though, that the burger is basically beautiful. It is soft, juicy, and choice – like a bigger version of the excellent one at the Burger Joint at the Parker Meridien. It is heftier than many burgers, including PJ Clarke’s, but not as massive as the Bozzi Burger at the Palm or the one at Wollensky’s Grill. 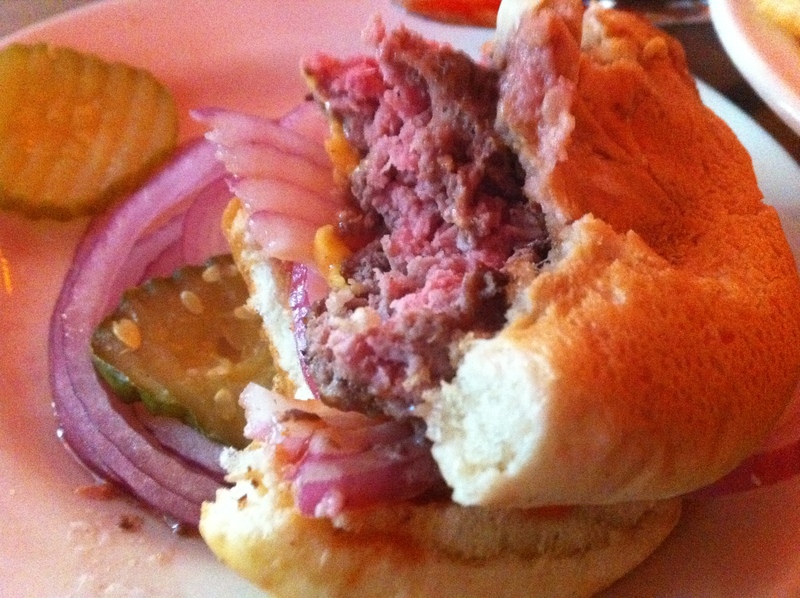 Few burgers match its quality, flavor and heft. If I’m honest, it is more succulent than the brilliant ones I’ve been eating lately at the marvelous Mel’s, which I still heartily recommend. It is served with red onions and medallions of pickle on the side, so you can stack it as you will. The burgers, which are fatter patties, are a mix of lean and fat grinds, with a strong emphasis on lean. 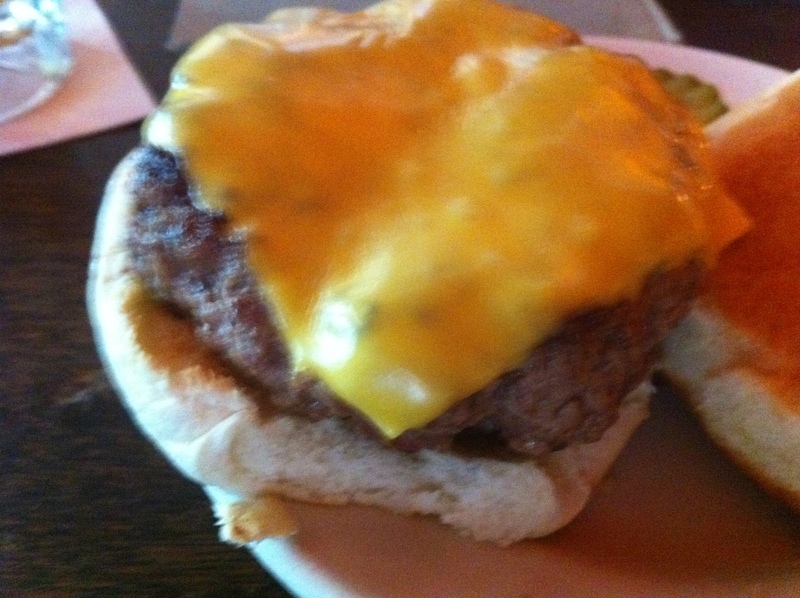 The cheeseburger clocks in at $9.75, and is well worth it. Their fries, in medallions, are unique. The cottage fries do not come with the burger, they need to be ordered separately. As you can see, they come shaped like chips, of a sort. They are puffy, and for you “I love fries as salty as McDonald’s” folks out there, prepare for disappointment. They are not very salty at all, which I appreciate. They don’t taste particularly like potato, either. 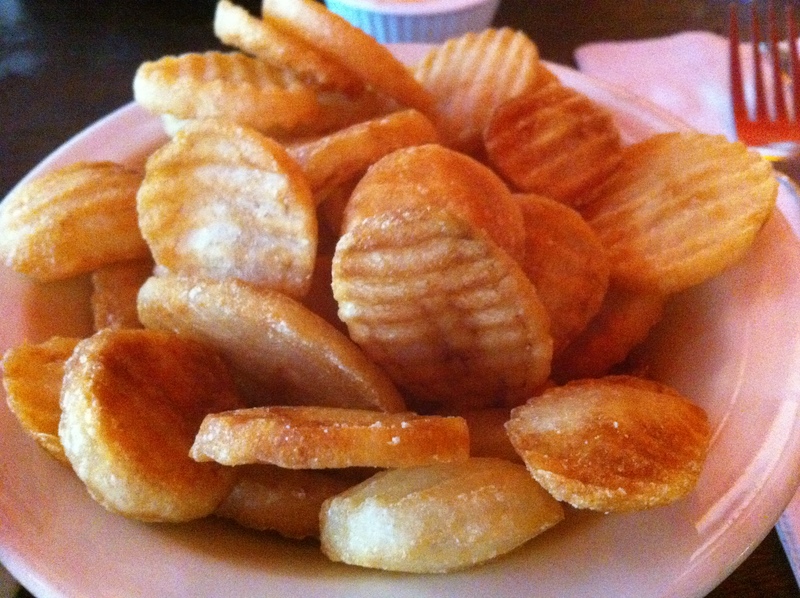 The interesting thing is what you taste depends entirely on the thickness of the individual chip. For many of them, the potato has been cooked out of them and you get hollow puffs, sort of similar (but not quite) to good tater tots. Occasionally you will stumble upon one loaded with fluffy potato and it is heavenly. Just beautiful color. No flame control problem here. For two beers, a cheeseburger, and an order of chips, I spent $26. It was well worth it. The place is great.